Dark, heavy clouds hung low this afternoon. Although it felt like snow, only rain fell. Then in early evening, the rain changed to wet snow. I don't think it will last but the magic of snow falling quickens my heart. It's a good night for staying close to the fire. I've made some Christmas cards - still have more to do. These were simple, but I like the look. Last weekend my sweet husband went through the house taking photos of EVERYTHING. We've talked about doing this for years - keeping a record somewhere for insurance purposes. He opened drawers and cupboards and the resulting pictures are not very pretty. But this was. And I thought about how I need to take stock of my internal inventory from time to time. Are there priorities that need to be re-arranged? How am I balancing my time and resources? Do I need to straighten out some relationships? Clear away clutter? At this time of year, approaching Advent, it's good for me to evaluate, to ponder, to prepare my heart for the celebration of Christ's birth. Alison, over at Brocante Home> issued a lovely challenge. I didn't think I'd get it done with all the craziness that's been happening here, but I did. Here is the quotation from her Puttery Treats - and there are lots more to inspire you to savour the beauty of everyday. "This is candle season. When it isn't cold enough for the fire, use a mantlepiece glittering with candles to trick the mind, simmer cinnamon on the stove, drink red wine and really good cheese. Gather all you've got: every candle, and holder and take a look at your stock. Throw out what’s past it's best and then go candle shopping- buy them in all shapes and sizes from tea lights to big fat pillar candles, but remember you don't have to buy expensive scented candles: scent can be layered in so many other ways (Tuck oil soaked cotton wool puffs behind hot radiators for a start). Ikea’s range of standard candles are extremely reliable and cheap enough to buy in abundance." Today, after I tidied my classroom and planned tomorrow’s lesson, I got in my car to drive home. Darkness was creeping across the city and I had to turn on my headlights. The swish of tires on wet pavement and the monotonous flip flop of windshield wipers made me long for sunshine. Lighting a candle on such a night pushes the darkness away. This evening I will read for awhile in the living room, cuddled into a soft blue throw while a white pillar candle casts its warming glow. With a cup of hot chocolate beside me, I am content. A friend once suggested that having a lighted candle on the breakfast table gives the illusion of warmth on a wintery morning. There’s something special about the softness of the light. The flickering flame mesmerizes the family into lingering long at the table, enjoying each other’s company. Candles in the bathroom are an easy luxury. I place a few votives on the countertop and light them while preparing for bed. I wrap myself in my robe and slowly clean my face by the soft glow of candlelight. The dancing flames of tea lights set along the kitchen windowsill are reflected in the dark window behind. I simmer some dried orange peel, a cinnamon stick and a few cloves and whole allspice to fill the air with natural scents. Tall tapers on the mantel combine with a few silver pieces and some crystal. Set against the navy blue wall, with delicate lace doilies underneath, the candles add easy elegance to my living room. I love to arrange vignettes throughout my house on which to focus my eyes. The small, carefully arranged displays most often include candles. While a child would be delighted with these dolls, I think they are just for grownups. What do you think? I found them over here at White Country. They are utterly charming with the small details and wonderful handwork. Our church holds three services each Sunday - two in the morning and one in the evening. Today they honoured our fallen soldiers and also those currently serving in Afghanistan and other places around the world. Bagpipes while the flags were brought in and for the singing of Amazing Grace. Silvered trumpet tones playing the Last Post. Scenes of our soldiers honouring our recent dead, of coffins covered with our red and white flag. Readings taken from history comprised part of the service. My part, for all three services, was to read a letter, the last letter written by a young man just about to go into battle. I have a son about that age. I can't imagine the grief that would flood my being if I received a telegram such as that mother in World War I received. And I will be thankful for those who served. I will remember. I'm doing another post to see if I can get the pictures from the previous post to show up. They did when I first put them up and have since disappeared into thin air. I like creating in a variety of mediums, but my favourite is fabric. Paper runs a close second. I took a look around my home trying to take photos of the fabric items I've made. I couldn't find very many. A lot of what I stitch is for gifts. And I sew clothes for myself, which don't look very good photographed in the closet. I'm not about to model them for photos, either. This is a watercolour lap quilt that hangs off the railing in our front entry hall. I made it about 12 years ago and still love the way the colours blend. Pillows are easy and fun. This was a quick project for our bed. I wanted to do something with buttons. This is what resulted! Another quilt. This is a table square, made about 15 years ago. My plan was to make a table quilt for each season. This is the only one that's finished, although two others are in the works. It takes me a long time to finish them. I love the choosing of fabric and the piecing - but not the finishing and quilting. If you love fabric as I do, run on over to Paris Bebe for some inspiration. Lovely fabrics and a giveaway. Such lovely packages. 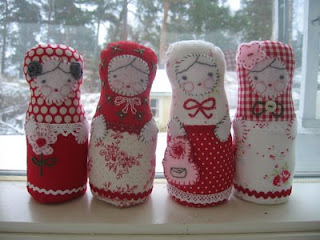 This weekend I hope to complete the project for the Deck the Halls Swap. Here are a few hints, but I can't show you the entire project because (1) it's not done yet and (2) my partner Andi might see it here. But I'm excited about it. I love to make lists. Lists keep me organized and on track. If I don't write things down they quickly disappear from my radar screen of things to do. Making lists at this time of year is especially important - there's lots going on. I've started my Christmas shopping and have begun making a few items. I thought that this year, since I'm teaching school temporarily, I would cut back on the handmade articles. But you know what? One of my classes is extremely challenging (read stressful) and I find such relaxation in sitting down creating something with my hands. All the disruptive behaviour, phone calls and emails to parents and detentions fade away. I NEED to create. I made 5 of these little planning books. They are just 5 x 7 inch spiral notebooks. I covered the front with printed scrapbooking paper, added a stamped label on a torn sheet of contrasting paper and then made cardstock tabs stamped with Gifts, Food, Projects and Inspire. The tags are the width of the book so they won't tear easily. I glued them to individual pages. Saturday was a lovely day - we celebrated 2 birthdays. Mine and my eldest daughter's. I just love being together with my family. We relaxed, ate, laughed, watched a movie, ate some more. I found some red mugs for my daughter, to match her newly renovated kitchen. The box was so pretty that it didn't need wrapping. For this gift I covered the top of the box with scrapbooking paper, glued ribbon around the band and tied it all up with a polkadotted box and a tag made from scraps. I've decided that this Christmas I'm not buying wrapping paper. While I love making gifts look special, I hate the waste of wrapping just to throw it out. I made some fabric sacks a couple of years ago and I reuse them every year. And there are gift bags, but I like to wrap boxes, too. I've got some ideas up my sleeve and I'll be sharing them with you. This morning I filled a sink full of hot soapy water and let my crystal candleholders and vases soak for a bit before rinsing them and drying them to bring out their shine. While the crystal soaked I donned a pair of gloves, spread some paper over the kitchen counter and polished a few bits of silver. Silver candlesticks, a graceful bud vase and a tiny mug engraved with my husband's name. It was a gift from his grandparents when he was born. The inside needs refinishing and it's just used as a decoration although all three of our children did take a few sips from it. I cleared away the harvest decor from the mantel, china buffet and tables and dusted everything well. Then to the rearranging - my favourite part! I added, subtracted, adjusted and squinted to see that everything would be just right. There's still some tweaking to be done, but in the meantime I'll enjoy the pairing of soft silver and brilliant crystal combined with delicate lace on my mantel. She's married now, has a responsible job teaching English to high schoolers and is one of my dearest friends, but 26 years ago, in a small mission hospital on the edge of the Amazon jungle, she was my firstborn child. She was tiny and perfect. Her father and I gazed in wonder at her scrunched-up face and thought of her as our princess. We couldn't imagine what her life would bring, how she and her siblings would colour our lives with joy.